With proper ammunition, even an over an under shotgun can be a formidable weapon in a pinch, but the issue with the UK is that what weapons are owned may not be carried. That reminds me unpleasantly of New York and similar enlightened places. No wonder that places like that stay vulnerable to attacks, while Switzerland and the better armed American metro areas have had few successful terrorist events. Perpetrators usually lasted just long enough for the locals to figure out that their actions weren not accidents. This entry was posted in rkba, self-defense, shotgun, weapon and tagged 12ga. Bookmark the permalink. 21 Responses to What can the Brits do? The journey of 1,000 miles begins with a first step. But that was Brexit, so they’re already on number 2. For starters, recognize that *sometimes* you have to fight. Anything that can be picked up, thrown or swung can be a weapon. Islam is a death cult. It cannot be tolerated in, or by, any society that is not willing to convert to Islam. As long as the Islamic death cult is allowed to exist IN ANY FORM; IN ANY NUMBERS in any western nation THE ATTACKS WILL. NOT. STOP. You cannot “kill a few radicals” and be safe. If you could the Jews would be the safest people in the middle east. There is one AND ONLY ONE way to end Muslim terrorist attacks . KILL.THEM. ALL. Every man. EVERY woman. EVERY child. This has gone on for 1400 years, and there IS NO road to peace with Islam that does not involve genocide, ours ,or theirs. We have tried half measures for centuries . They DO NOT WORK. So if you are not ready to live with constant suicide attacks . Then you had best get ready to swim the river of blood. Because Islam DEMANDS that you , your wife, your children, be converted, enslaved ,and/or murdered. They will never stop until we stop them. As with any war, this one will end when the enemy decides that it is futile to continue, that further hostility means certain destruction. Killing them all is not required. Convincing them that we’re perfectly willing and capable of killing them all is required. Start with the leaders, the imams. We know where they are and we know what they’re doing. You’d be surprised at how quickly a Muslim reformation movement would materialize when their leadership, their institutions and their mosques started disappearing in a declared, explained worldwide campaign. The ironic thing (though only ironic to the ignorant) is that if Western Civilization had declared an all-out war of extermination against Islam centuries ago, it would have saved countless lives, of Muslims. Since we’ve let it fester, the Muslim world has been living as backward, brutal, unproductive, ignorant shithole while the rest of the world has left it behind by centuries. It’s like a spoiled, misbehaving child that’s never received correction from his cowardly, appeasing parents. Appeasement of evil results in more and bloodier war than any other force on Earth. But the Western World (by which we mean Judaeo/Christian Civilization – let’s be clear on that, for there is no Western World otherwise) has forgotten what it means to fight, it has forgotten it’s principles, does not know the meaning of resolve, and it has fallen to appeasement as official strategy. And so the problem will get worse, and worse, and worse. In the end, we will have invited, appeased, encouraged, fomented and even engineered our own destruction. In that sense, the Muslims are correct, in their own way of thinking. No I think you are dead wrong. “Convincing them you will kill them” can only work with a rational human that wants to live. The Islamic terrorist WANTS TO DIE! That is the goal. FOR THEM TO DIE KILLING YOU. This is where you, the Pentagon, in fact the entire world has lost sight of the truth. ISLAM IS A DEATH CULT. They WANT to die. To be killed while fighting IS THE GOAL. There is no other way than to submit to Islam or exterminate Islam. Everything else only applies to rational humans. 1400 years. Think about that. 1400 years of Jihad. Everything else has been tried, and failed. All it takes is reading an issue of Rumiya to absolutely confirm your point about their looking at dying as a reward. Looking over their AARs they note how many enemies were killed, and how many of their own “attained shahadah”. There’s many instances of that kind of language in just one issue, as well as talk about how the only way to appease the wrath of their petulant moon-godlet, Allah, is by dying while killing Crusaders. Here is one of my two suggestions about the use of nuclear weapons in this post. The other is below. The use of just one nuclear weapon to vaporize Mecca would end islam. It would cause an existential crisis in their perverted, evil death cult. The muslims would have to doubt the absolute veracity of the koran with its command for pilgrimage to Mecca when it has been destroyed and reduced to a radioactive hole in the group? Disproving anything in their (fake) holy book that is supposed to be perfect in its transcription, invalidates the whole thing. Islam should then fall apart (or we get the final war with them to finish them off forever. Note that my eschatological understanding is that this will not happen though. God will demonstrate his Vengeance and Justice on them). At some point if the Government isn’t going to protect you…you have to protect you and yours- even if it means becoming an outlaw to do it. They’re at that threshold…sadly, we’re not much behind them. You’re understating the issue. The government is never going to protect you. Never has, never will. The government has no legal duty to do so, that has been settled law for decades. What the government’s minions will do is mop up the mess, gather evidence, (some of the time) arrest the culprits and (even less often) lock them up for a while at our expense. Protection of individuals comes from self-defense and, at times, the assistance of helpful bystanders. Oh yes, and sometimes, for those who are rich enough and have purchased enough politicians, from the assistance of bodyguards. Unfortunately, in much of the world, self-defense is illegal. If it isn’t explicitly illegal all the time, it it at the very least illegal to commit self-defense effectively (i.e., with a suitable weapon). 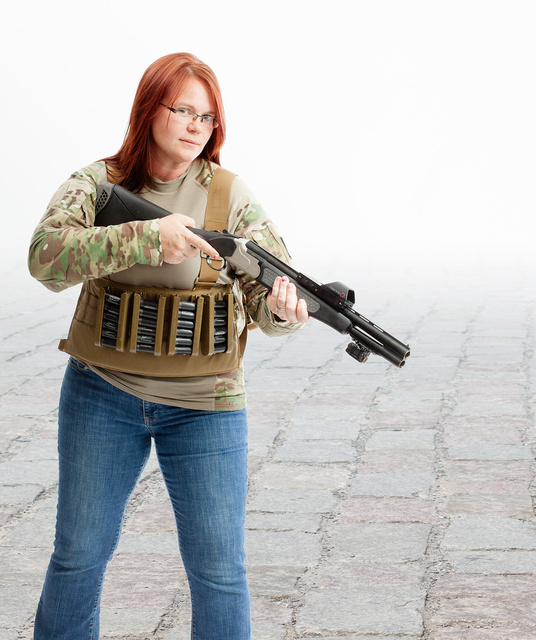 To get back to the picture – I have never seen an over and under shotgun SBS tacticool like that. On the other hand, perhaps England could finally find a real useful purpose for the Chiappa Triple Threat or the Mossberg Shockwave? Heck, I think some Englishmen and women would be happy if they could find an old Wetly or Trantor -anything is better than thrown bottles and chairs! I hate autocorrect – that was supposed to say WEBLEY…. In England you have to have 24″+ barrel. To get the license for the gun you have to prove a very good reason, if you say self-defense you will be band for life. The gun can only have two shot fixed magazine. What a disasterous nation. I’d like to pity them, but they do this to themselves. It’s like watching your heroin-addict sister running tricks out of her living room to pay for her fix. Some people can’t be rescued. Let their ‘end’ be well-documented, but do not interfere. Nothing more dangerous than a drowning man. It saddens me to say it but the “Great” was kicked out years ago. I’m making two comments about the use of nuclear weapons for this post, but for very different reasons. In this case, the United States had better be ready to use our nuclear arsenal to devastate the nuclear capabilities of the UK when they eventually succumb to the muslims. Read above for the other nuke use. It is hardly feasible to walk around London with a shotgun anyway. Of course you should have a shotgun for home defense (and an AR/AK for civil defense), but what the people of London needed the other day was the concealed carry pistol. British people need pistols, and the right to carry them, but I don’t see that happening any time soon. Fixing the gun laws in the U.K. has to start with fixing the laws regarding self defence. The gun laws are the smallest part of it. Yes,but what you are looking at is the direct result of the loss of two complete generations of good men. Look at Germany and even France for that matter. Two world wars devistated the true backbone of theses nations. Think about that for a min. There is a direct connection. Sorry,my comment was to Tims comment. Then again, that was a couple of generations ago. Also, while that could explain general wimpiness, it doesn’t explain the ruling class’s hatred of self defense. That hatred is more easily explained by the fact that ruling classes have always wanted the lowly subjects to be defenseless.